At the suggestion of St Augustine, Paulus Orosius, wrote the first universal Christian history, finishing it in 418. It is divided into seven books: the first covers the period from the Creation and the Flood to the founding of Rome, and much of the remainder concentrates on Rome. This manuscript (which also contains others historical works) was probably written at, and certainly owned by, the Cistercian abbey at Rievaulx, Yorkshire. 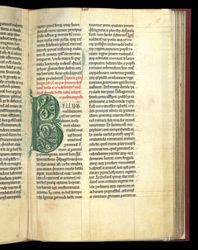 Book VI is introduced by the fine initial 'B', in green with only the subtlest touches of pale yellow. Cistercian constitutions in the 12th century stipulated that initials in manuscripts should be of one colour only, without gold, and without figures. Despite (or perhaps because of) such restrictions, Cistercian artists managed to produce initials of remarkable elegance.